New release of Firefox (version 15) support lot of new features like Responsive design check tool and even an in-built PDF viewer. This allows you to directly open any PDF file with-in Firefox browser without having to launch third party program for viewing PDF files. As such PDF files viewing feature should work out of box – you still can confirm on few settings for using in-built PDF viewer in Firefox browser. Before changing settings, open any online PDF file to confirm if PDF files viewer is working in Firefox or not. If you get prompt to download PDF file or some other program launches for PDF viewing, then you need to re-visit PDF file settings in Firefox. 1. Open Firefox browser, click Firefox button and goto Options > Options. On the Options box, click on “Applications” tab and look for “Portable Document Format” in the listing. 2. Under Action column click next to “Portable Document Format” and select Preview in Firefox option. This will make PDF files directly open withing Firefox web browser. You may select other options like “Always Ask“, where you will get prompt for further action while attempt to open any PDF file. You may also select “Save” option that allows you to save PDF files on your computer instead of directly previewing it. From above settings, you can configure and set custom settings for PDF file opening within Firefox browser. Enable / Disable in-built PDF viewer in Firefox. 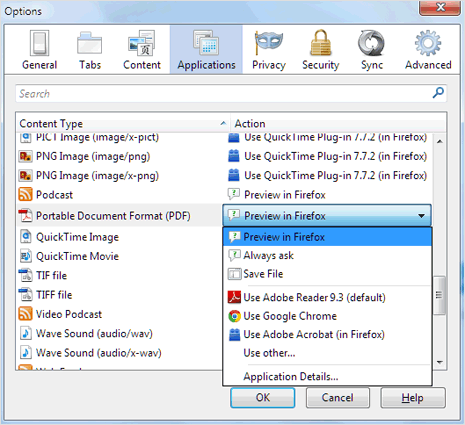 You may not want to use in-built PDF viewer in Firefox and use different application program for opening PDF documents. You can internally enable or disable PDF viewer in Firefox. For this you need to make changes in configuration of Firefox browser installed on your computer. 1. 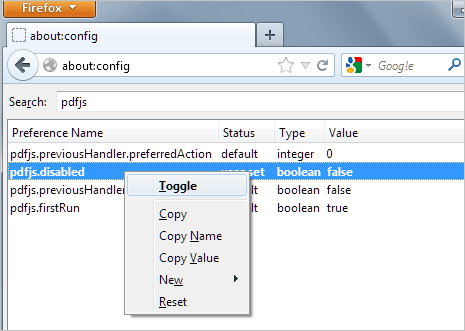 Launch Firefox and type about:config in the address bar. Then click “I’ll be careful, I promise!” button on warranty screen to continue to configuration page. 2. Then type pdfjs in search box and press then Enter key. Now right click pdfjs.disabled;false entry and toggle it to true state. This will disable in-built PDF viewer in Firefox. To enable PDF viewer, keep pdfjs.disabled entry to false state. No need to open pdf in Firefox.